Why do I get runny nose, sore throat and cough more often? How can I protect myself from runny nose, sore throat and cough? How long should I take Esberitox® N ? Take when you have first sign of runny nose, sore throat or cough. For protection, you can take during period of stress or when you are likely to get these symptoms. Is Esberitox® N more effective than Vitamin C in boosting the immune system? Esberitox® N is fast acting, you will feel the effect in 2-3 hours. Clinical Studies have proven Esberitox® N to be more effective in protect against runny nose, sore throat and cough. Is it possible to know whether my runny nose is caused by allergy or weak immune system? 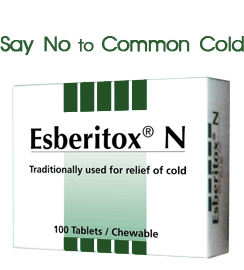 If you have a weak immune system, one or two doses of Esberitox® N will stop your runny nose. However, if you have allergy, the runny nose will not stop. If I need advice, how can I contact you? It is available in most pharmacies.